Tender chunks of beef, vibrant veggies, and creamy potatoes all cook together in a deliciously seasoned sauce in one pot on the stove. 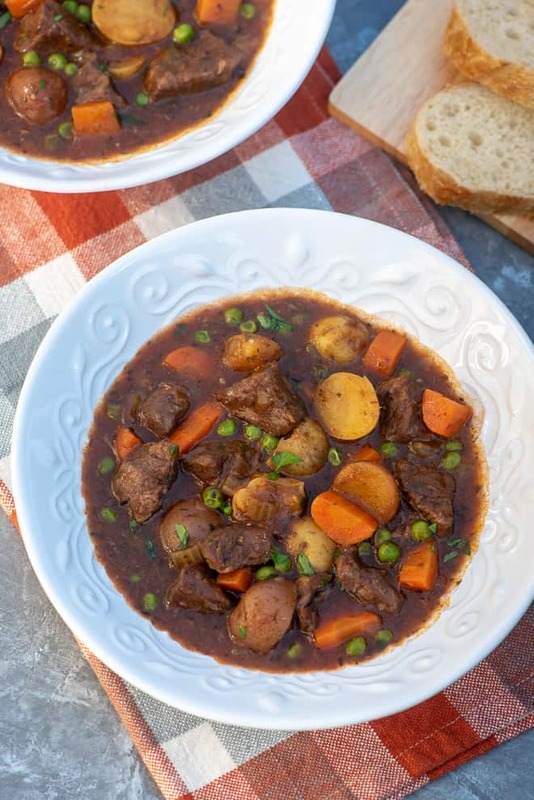 This Classic Stovetop Beef Stew is a recipe that never goes out of style. 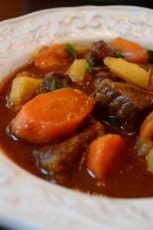 Everyone should have a solid beef stew recipe in their collection and this one is mine. 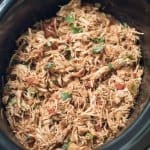 It is astounding to me that I’ve been at this blog for nearly 8 years now and I have not shared this recipe with you until today. I think it’s just one of those things like putting on your shoes every day. You do it all the time but never think to tell anyone about it. Well, this rustic stew is as lovely as my loveliest pair of shoes and it absolutely deserves it’s turn in the spotlight so here we go! 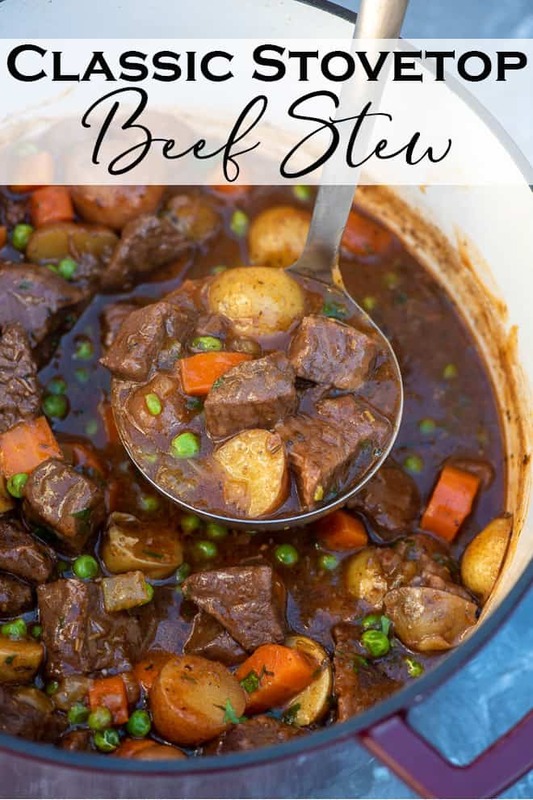 There are so many methods out there for creating beef stew but I believe it’s important to start at the beginning and learn to make a classic beef stew the old-fashioned way. 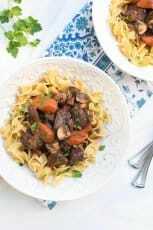 Cooked slowly in one pot on the stove until the sauce is rich and thick and the beef and veggies are fork tender. 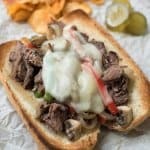 If you’ve tried my Instant Pot Pot Roast you know I do something a bit unique with the seasonings which makes a huge difference in the result. 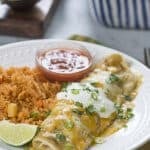 I do something similar in this recipe. 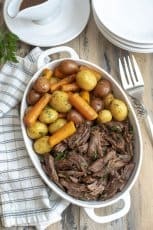 The ingredients are the usual suspects – beef chuck roast, baby potatoes, celery, carrots, frozen peas, onion, garlic, and a little fresh Italian parsley. You’ll also need a few dry seasonings (detailed below). Pick up the beef chuck packaged as “beef for stew” to save yourself the time and effort of trimming and cutting up a whole roast. I still find I need to cut some of the larger pieces down to be bite-sized, but let the butchers do the hard part. The rest of the prep is minimal and once you get it going, the process is mostly hands-free. 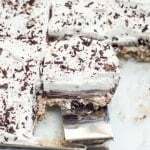 The first step is what makes this recipe unique and ensures a fabulous result. A delicious assortment of dry seasonings are combined to create a mixture that is added in layers to the stew. First to the chunks of beef as they are browned and later to the sauce before it all simmers together. 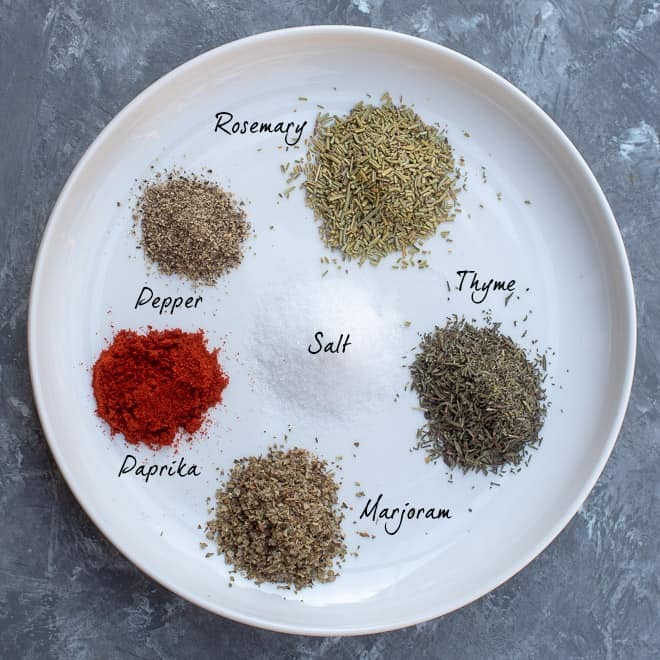 The seasonings are simple and include rosemary, thyme, marjoram, paprika, salt, and freshly ground black pepper. This mixture adds a flavor component to the stew that takes me home! 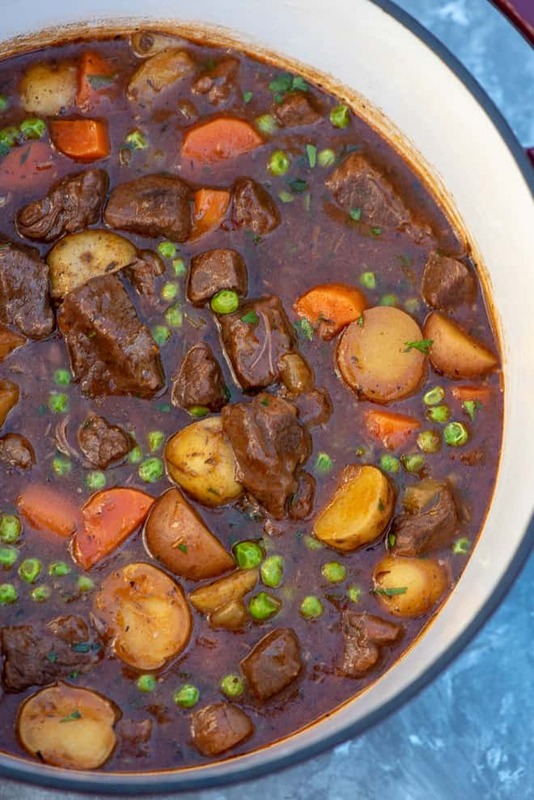 In addition to adding flavor, the paprika does a nice job of adding rich color to the stew. The sauce starts with a little tomato paste, low-sodium beef broth, red wine, Worcestershire sauce, and a bay leaf. 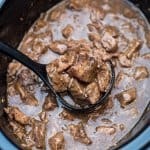 It’s thickened at the end of the cooking process with a simple cornstarch/water slurry into a luscious gravy-like sauce for the beef and veggies. 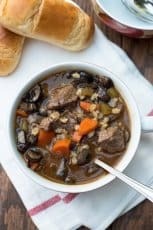 You’ll want to serve the stew with French bread for dipping. 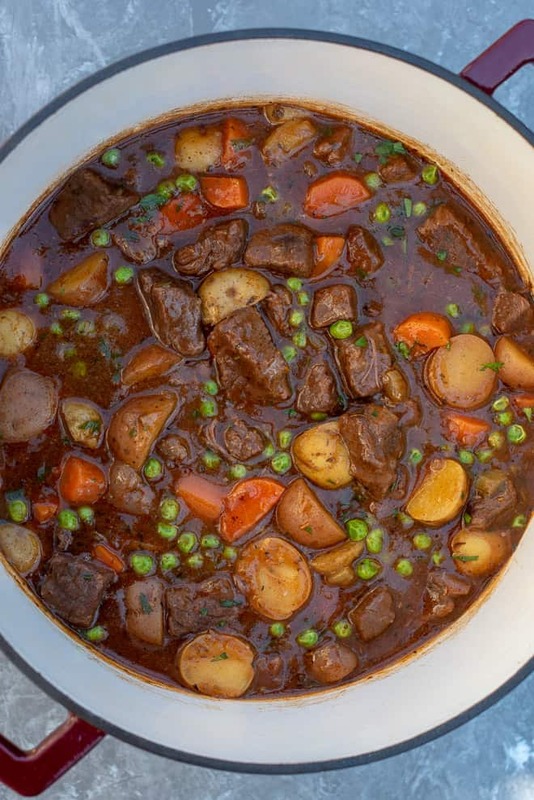 The beef stew requires about two hours of simmer time which is the reason why recipes like this are a Sunday supper tradition. I can’t think of a more perfect choice for a comforting meal before the start of a new week. Combine the seasoning mix ingredients in a small bowl. 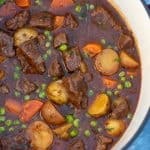 Cut any large pieces of stew meat into smaller bite-size pieces, if necessary. Heat the vegetable oil in a large Dutch oven over MEDIUM-HIGH heat. Add about half of the meat to the pan, or as much as you can without overcrowding the pan. Sprinkle 2 teaspoons of the spice mixture over the meat and sauté the beef until nicely browned. Use a slotted spoon to transfer the beef to a dish and set aside. Repeat with the remaining beef, adding additional oil if needed, and seasoning with 2 more teaspoons of the spice mixture. Reserve remaining spice mixture for later. Add additional oil to pan if needed and add onion, celery, and garlic. Cook, stirring occasionally, until softened. Add the tomato paste and stir until well combined. Add the red wine and increase the heat under the pot to bring the mixture to a boil. Add the beef broth, Worcestershire sauce, remaining spice mix and the bay leaf. Add the beef and all the juices that have accumulated back to pot and bring to a boil. Reduce heat to LOW, cover, and simmer for 1-1/2 hours, or until the beef is fork tender. Add the potatoes and carrots and raise the heat under the pot to bring the liquid to a boil. Reduce the heat to LOW, cover and simmer for another 30 to 40 minutes until the veggies are fork tender. Stir in the frozen peas and parsley. 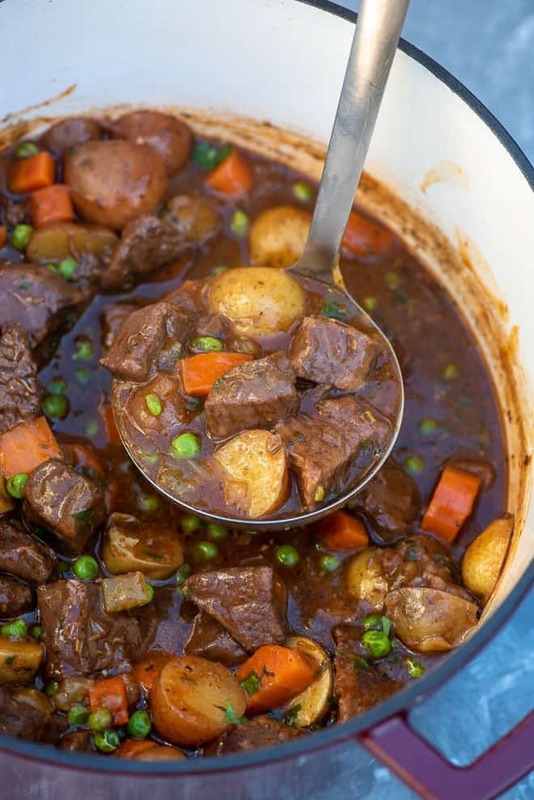 Combine the water and cornstarch in a measuring cup or small bowl and stir it into the beef stew. Continue cooking, uncovered, until thickened. When do you add the carrots? With the potatoes? Yep! Thanks so much for catching that 🙂 The recipe card has been updated. 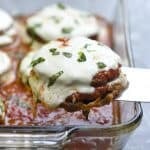 We made it last night and it was absolutely delicious, and very easy! Definitely a keeper for our family. I always feel discouraged when I see a recipe that requires wine. I am clueless about cooking with alcohol. Are there certain brands I should use? Or is Barefoot or Beringer ok? Hi Nicole. If you are not a wine drinker you can substitute with additional beef broth but you won’t get the same depth of flavor in the finished dish. If you do want to purchase a bottle, go with one of the varietals I listed in the recipe card. You don’t need a super expensive bottle of wine so something in the lower to medium price range is going to work just fine. And, yes, Barefoot or Beringer will do the trick! I’m not normally one for stews or casseroles but your pictures looked good so I gave it a try. I was blown away! We loved it! The flavors in the broth, the tender beef- it was all delicious! I’m already planning on making it again. Thanks for sharing!